This is a worksheet to be used when learning about text features. This scavenger hunt goes along with the Non-Fiction Text Feature Poster set. This could be used as a center activity once the text features are taught. 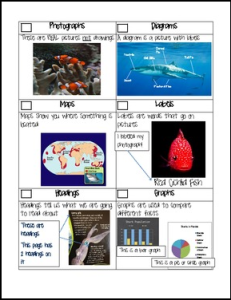 This helps to encourage students to pay attention to text features as they read non-fiction rather than skip over them.